Understanding the psychological factors related to space design and furniture choice is only half the battle. When considering furniture that encourages innate human behaviors, we need to also address the functional aspects. Furniture needs to make people feel safe by providing them a sense of Haven and protecting their Personal Bubble without sacrificing comfort or functionality. Today’s installment in our Designing for Modern Human Behavior series looks at how the angle of a chair can have a powerful impact on productivity. We often discuss comfort in relation to the photo above, as the girl’s seated position embodies the appropriate sit for a focused work pattern. When somebody sits in a seat that’s designed for a given task, it’s easy to see their comfort level is greater than it would be in a seat not intended for that use. Understanding the work patterns of your patrons is an important factor when choosing a comfortable piece of furniture. Spaces change, but instinctual work patterns do not, so placing furniture that’s not suitable to a specific work pattern usually ends up being unused. 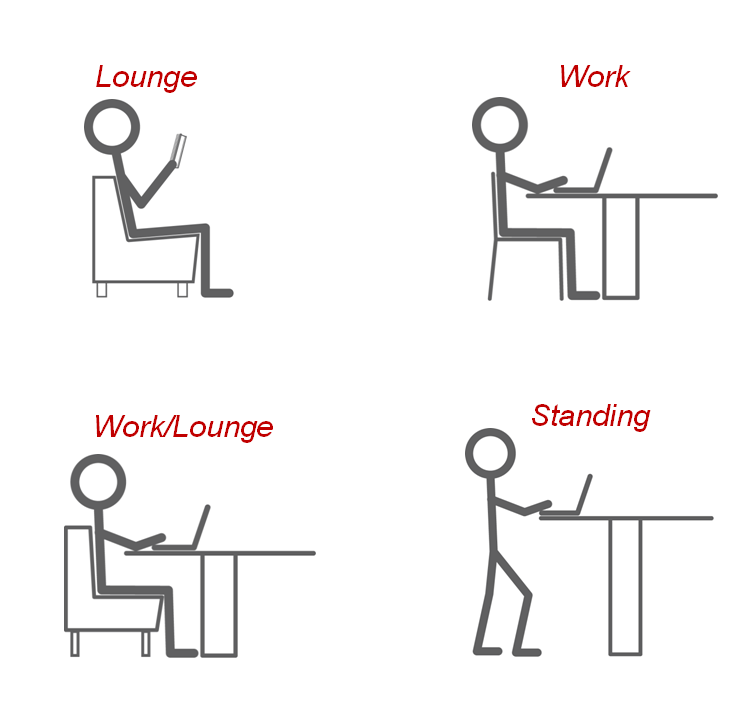 Human work patterns and their sit types can be broken into four types: Lounge, Work, Work/Lounge, and Standing. First we’ll investigate the Lounge work pattern/sit. Our discussions on lounge seating revolve around the “20/20 Rule”. 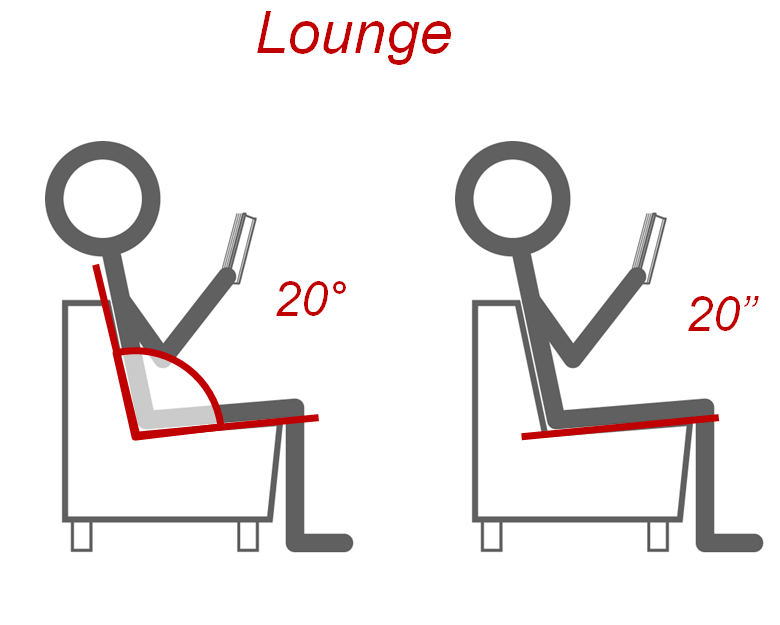 This means that a proper lounge seat will have a 20 degree recline on the seat back and that the seat is 20 inches deep. Not every lounge chair will precisely fit these measurements, but remember the seat back will be much more reclined with a deeper seat than a standard chair. Activities that take place in lounge areas tend to take place for roughly 10-15 minutes, such as checking your phone, tablet, or hanging out waiting for friends. The outlier is reading, which will often take place for 60-90 minutes. The second work pattern is what we’ve aptly named “Work”. A chair suited for a work task follows the “10/18/18 Rule;” The seat back is at a 10 degree recline with the height and depth of the seat at 18 inches. Like the lounge chair, these aren’t exact measurements but keep in mind the seat back will be much more vertical than a lounge seat. Activities associated with Work seating are your traditional long term focus tasks such as paper writing, research, etc, all of which take place for 30-60 minutes. The third work pattern sit is a hybrid of the previous two, called the Work/Lounge sit. This hybrid sit takes the cushion/soft part of lounge seating and combines it with the ergonomic profile of work seating, like banquettes. We distinguish this work pattern and work sit type in its own category because too often people will try to put a regular lounge seat with a standard table to create a work area. With a work/lounge chair, the user’s back is fully engaged with the seat back, not perching forward to reach the table as with a lounge chair. The tasks performed with work/lounge seating are the same as traditional work seating. These are done in “camping mode,” where users unload their bag, camping at a seat to perform writing work, computer work, studying, or group meetings – All for 30-60+ minutes. The last work pattern is the Standing work pattern, typically found in academic settings. The best suited tables for standing work are about 42 inches for the height of the work surface. Standing tables/work area tasks are usually completed in 15 minutes or less – These include quick meetings and short tasks like email or basic research. The visual below presents each work pattern/sit with the various times people spend performing tasks in each pattern. It’s important to see it in this fashion to understand how the work pattern and goals relate to a user’s sense of comfort in a given environment and furniture. While it’s tempting to select furniture based solely on comfort, one does need to keep their eye on how it accomplishes a particular function during the shopping process. Placing the right furniture in the right areas will help patrons feel comfortable not only in the furniture but also the surrounding environment. For example, placing standing height tables next to private study carrels or work areas will be a disruptive environment and uncomfortable. The moral of the story? Creating a comfortable environment encompasses both furniture and space design, and by working with innate human work patterns, it’s easy to achieve.